As March neared it’s end (my goodness does time fly!) a group of my fellow CGEE students and I found ourselves squished into a hot van, eased only by the breeze of open windows, making the 11 hour trek to Northern Namibia and the small rural village of Outapi. We each spent the week with a host family learning about life in the more rural traditions of Namibia and the rich history it holds. My host family consisted of a mother, father (who was away most of the week for business), three children, two nieces, and another young woman who assists with chores and life around the house. Though the homestead I lived in was quite full and never in true silence– the home also boasts a wide variety of animals including puppies, chickens, and donkeys– I quickly found myself at immense peace with the pace of life led in this rural setting, which is a statement echoed by many participating in home stays in the area. While we were prepped not to expect electricity or running water, we quickly discovered that rural Namibia is just as diverse in its amenities as homes anywhere else might be. In my home the television is a staple piece of entertainment and electricity plentiful, running water however existed only at a tap from the ground a few meters from the living quarters. Though electricity is plentiful at my homestead, the family still uses traditional practices of the open fire to cook meals– incredible meals, I must add! Throughout the week, starting with the very first days, I found myself in awe of the roles that children play in rural homestead life. Starting at ages as young as three or four, children can be found (and expected) assisting in care and keeping of the home. 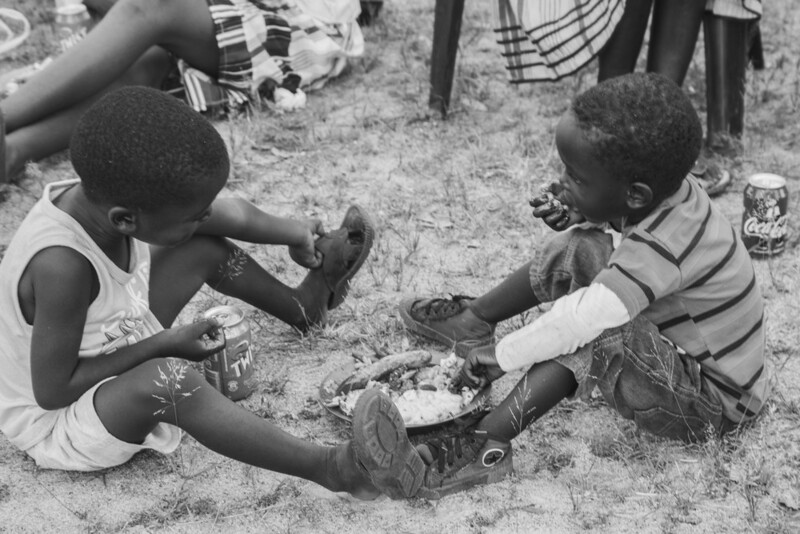 As often as the children in my home could be found wrestling and playing, they could also be found caring for the youngest (9 months) or helping prepare meals. A quick memory regarding the children in my home that I cannot allow to go amiss from this post, is that of an evening when the majority of the children and I were settling ourselves in the living room to prepare for dinner, when the oldest child broke out into the chorus of “kumbaya”. Without much thought I found myself singing along. After several days of language barred conversations and curious stares at the odd white girl with white hair and weird pictures on her arms, this was an experience we all understood. As the realization registered on the faces lingering in the room, an immediate, collective cheer of delight and room-wide sing-along ensued.